One thing my mother always taught me about birthdays: You’ve gotta have eggs. Sure, cake is nice and tasty. And candles — definitely the icing on, well, the icing. But eggs? No two ways about it. That was the absolute must. Every year on my birthday, she’ll either make me hard-boiled eggs or call to make sure I’ve had them. The eggs symbolize life and birth, after all. Paired with a bowl of noodles (for longevity) in a slightly sweet broth (for a sweet day and year ahead), this is just the super lucky trifecta I simply had to have every year. So, when the super lovely Karen over at GeoFooding suggested doing a favorite birthday treat for November’s Let’s Lunch to toast my special day this year, I didn’t need to think twice. My mother’s voice was already in my ear — eggs it was … Now, my mother usually makes me a basic dish of hard-boiled eggs and noodle soup but I thought I might try something a little different. 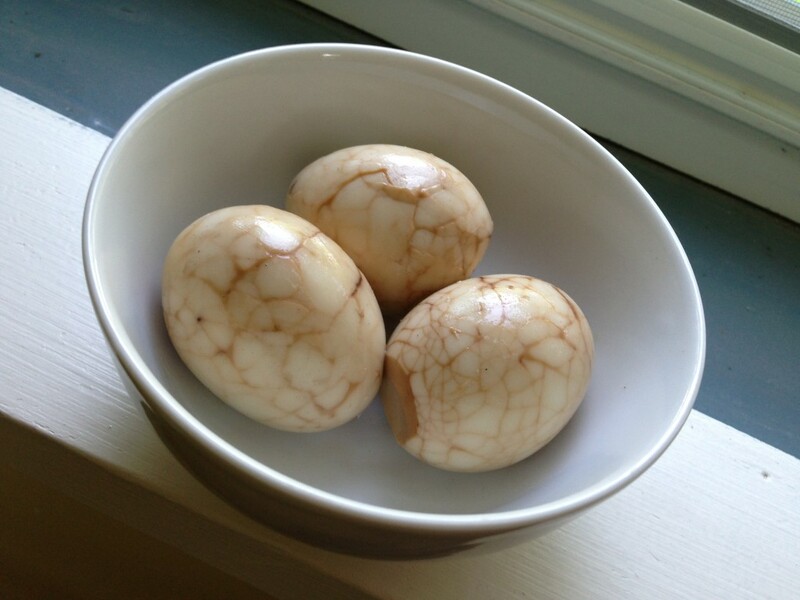 Since I adore traditional Chinese tea eggs, I thought I might try my hand at whipping some up. And it turns out they’re pretty easy to make — just boil soy sauce, water, sugar and tea with some star anise, cinnamon and cloves, add some artfully cracked hard-boiled eggs and let that steep overnight. Then, voila — you have yourself some pretty marbled eggs that are also darn tasty. They may not be as sweet as cake or festive as candles but eggs are one of my favorite birthday foods, nonetheless. So here’s to the day — and the year ahead. Let’s hope this lucky food helps usher in another good one! Don’t forget to check out other Let’s Lunchers’ favorite birthday dishes below! And if you’d like to join Let’s Lunch, go to Twitter and post a message with the hashtag #Letslunch — or, post a comment below. Bring soy sauce, water, sugar, star anise, cinnamon and cloves to a boil in a pot. Add Chinese tea and stir well, then gently place eggs in mixture. Let eggs simmer for a minute or two then carefully remove them, preserving the liquid in the pot. Run the eggs under cold water to cool them off enough to handle, then take a spoon and tap on them, creating cracks in the shell. The more cracks you make, the more intricate the design. Return cracked eggs to the liquid and bring back to a boil, then lower heat and simmer for 30 to 40 minutes. Remove from heat, cover and let that steep overnight. The next day, remove the shells and serve.